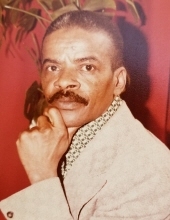 Mr. Elijah Manuel Williams, age 87, of Dallas, GA passed away Sunday, February 10, 2019 in Austell, GA. He was born on June 14, 1931 in Belize. Mr. Williams lived in Chicago, IL from 1978 until 2008 when he moved to Georgia where he made Paulding County Home. He had a love for sports and puzzles. He is survived by his wife, Mary Quinney, Dallas; daughter, Cheryl Mosby, Rockmart; and three grandchildren: Bernard Johnson, Carla Mosby and Hope Mosby. Graveside funeral and interment services will be held Saturday, February 16, 2019 at 2:00 pm at Rockmart Memorial Gardens. The family will receive friends Saturday afternoon from 1:00 pm until 1:45 pm at the funeral home. The Alvis Miller & Son Funeral Home is in charge of arrangements for Mr. Elijah Manuel Williams. To send flowers or a remembrance gift to the family of Elijah Manuel Williams, please visit our Tribute Store. "Email Address" would like to share the life celebration of Elijah Manuel Williams. Click on the "link" to go to share a favorite memory or leave a condolence message for the family.